$25 off per night is more valuable than the $100 off if you are going for more than 4 nights, but if you are spending more than 4 nights, the 10% off is probably better. For packages over $1,000, from best to worse: 10%, $100 off / $50 per person, $75 & 2,500 bonus miles, $25 off per night and then 5,000 bonus miles. Purchase of flight + hotel vacation required. Offers are not valid on flight-only or car-only bookings. Offers are valid for new reservations made between October 10 – November 9, 2011, and for travel between October 12, 2011 and February 29, 2012. 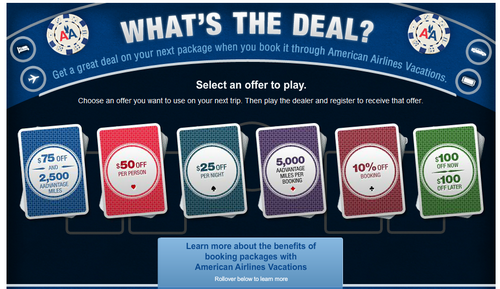 Promotion codes are not valid on any reservation that includes travel or a hotel stay on any date between December 21 – 26, 2011 or February 18-20, 2012.